Eight Republicans helped to reject a bill Thursday that would have sharply expanded a program that uses public money to send students to private schools. After a week of political bargaining over the state budget that included a failed attempt to consider the spending package on the floor and an emotionally charged press conference declaring negotiations had broken down, Republicans in the House of Representatives banded together to approve a $9.24 billion spending plan for the 2015 fiscal year late Thursday night. 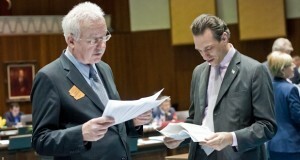 The Arizona House has begun debating a state budget plan that adds spending to the plan passed by the Senate. Six moderate Republicans put on a show of force this afternoon, marching out of the House to announce that budget negotiations between them and House Republican leadership had officially reached an impasse on the Senate budget proposal. Amid warnings of a potential lawsuit, the House Education Committee on Monday killed a bill designed to ensure funding for all students in the state empowerment scholarship account program. Government regulations on business and the free market are a favorite target of scorn from Republicans in the Legislature, but members of the party of limited government have introduced legislation this year to increase and expand regulations on a variety of businesses. Republican legislators who are facing a backlash from the conservative right for approving the expansion of Medicaid tapped into a vast network of supporters to easily outraise colleagues and opponents last year. When Gov. Jan Brewer used her 2013 State of the State address to announce she wanted to expand Arizona’s Medicaid program, she kicked off a clash that is still reverberating through the Republican Party. Rep. Doris Goodale, a Republican from Kingman, suffered a stroke yesterday while eating at a local restaurant and was transported to Sunrise Hospital in Las Vegas.